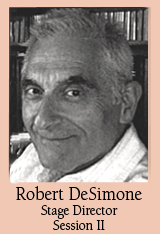 Robert DeSimone combines an active career as Stage Director, Pianist, Coach, Administrator. Originally a pianist, he received his musical education in Switzerland, Italy, England and the United States. He studied piano with Emanuel Bay, Paul Stoye and John Crown. A protégé of Nora Quarrie, Sadler Wells Theatre in London, he spent four years training in the tradition of England’s Royal Academy of Dramatic Arts. His opera studies include work with stage directors Hans Zimmerman, Herbert Graf, coach/conductor Luigi Ricci, Sergius Kagen and Hans Willi- Hausselein. He has directed in major theatres in Italy, Switzerland, Germany, Austria, Mexico, Brazil, Panama, Germany, Finland, Norway, Mexico, Costa Rica, the Kennedy Center for the Performing Arts, Krannert Center for the Performing Arts, Los Angeles Music Center, Lincoln Center, Seattle Opera and opera companies throughout the States. Arts administration posts include: Administrative Director- Music Center Opera Association Los Angeles, Director-City of the Angels Opera, Executive Director- Visual Arts Center of Alaska, Co-Director-Academia Vocale di Lucca in Italy, Artistic Director-Opera Panama. A recipient of awards from the Adolph’s Foundation, National Thespian Society, Italian Government, National Association of Piano Teachers, Austin Circle of Theatres, National Association of Teachers of Singing. He has received special commendation for his work in contemporary opera and the operas of Giacomo Puccini. Host for the cablevision series “Encore”. he is an active lecturer and presents Master Classes in Opera. Dr. DeSimone is Director of the Sarah and Ernest Butler Opera Center and holds the Sarah and Ernest Butler Professorship in Opera at the University of Texas at Austin.